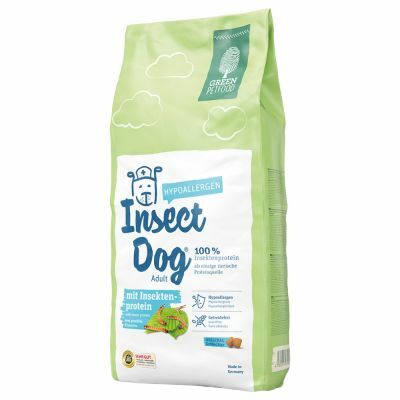 Its a miracle :"My dog penny has had skin and tummy issues for years I've tried every make and every protein source and raw and tinned and nothing helped even the vet couldn't help so I came across this food and i th"
Green Petfood InsectDog hypoallergenic is the ideal alternative for dogs that struggle with foods containing traditional sources of meat or fish. It contains 100% insect protein, which acts as a source of valuable animal protein and fatty acids. 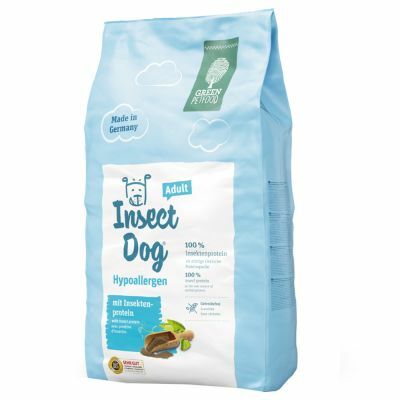 To date, insects have rarely been used in dog food. This novel source of protein has a low allergenic potential and is easily digested even by the most sensitive of dogs. Breeding insects also has low levels of CO2 emissions, making this food sustainable and environmentally friendly. As well as insect protein, which is the sole source of animal protein in this food, this grain-free recipe also contains vegetables, valuable sunflower oil and a balanced mix of vital nutrients. This ensures your adult dog gets all the vitamins, minerals and trace elements it needs for its wellbeing. This food is produced using only the best ingredients and is free from artificial colours, flavours and preservatives. An environmentally-sound delicacy for the modern canine household! Potato (dried), pea meal (natural source of amino acids), insects (10%), sunflower oil, yeast (partially hydrolysed), potato protein, minerals, beet fibre, carob meal. Vitamin A (12000 IU), vitamin D3 (1200 IU), vitamin E (130mg), vitamin B1 (10mg), vitamin B2 (15mg), vitamin B6 (15mg), vitamin B12 (70mcg), vitamin C (100mg), niacin (60mg), pantothenic acid (40mg), folic acid (4mg), L-carnitine (300mg), biotin (600mg), taurine (1000mg), iron (180mg), zinc (160mg), manganese (16mg), copper (20mg), iodine (2mg), selenium (0.25mg). My dog penny has had skin and tummy issues for years I've tried every make and every protein source and raw and tinned and nothing helped even the vet couldn't help so I came across this food and i thought I had nothing to lose so I bought a bag and boy what a difference solid poos and considerably better skin itching and biting has stopped by 80% wish I had found this food years ago. Even my Vet was impressed! Changed to this Excellent Kibble because of skin issues etc, Dog loves it, easy to swap to with no tummy problems, Nice firm poos, Skin has started to improve, After telling my vet what food we now use she looked it up and in a phone call told me "i'm very impressed with your choice"
My Welsh terrier has numerous food allergies and is only able to eat oats, pork, venison and white fish. We had tried a couple of dry foods but he was still covered in hives and losing his hair. Within days of starting insect dog his rash had gone! His skin and coat is healthy and he's happy and energetic- insect dog has changed his life I'm so glad I found it. I need to reduce the meat content for one of my dogs with liver issues and this looked like the perfect choice. With two ridiculously fussy /delicate chi's I was not hopeful but this was instantly popular with both (not something I say often!) so VERY PLEASED. My only niggle is that I now spend my evenings cutting up kibble into small bitesize pieces as its very large for small mouths! Will try the veggie option next. My staffy absolutely love this food. And she looks really healthy. Shiny coat and keeping her weight nicely. Her stool is solid and the issues she used to have with smelly discharge from her glands is long gone as they now empty perfectly every time she poos. Bonus - I have a good conscience knowing this is a environmentally friendly pet food that supports my green way of life. This food is an excellent choice to replace regular animal protein . My dogs , one old and one very young absolutely love this food. Shiny coats. Has cured older dogs skin itching and digestions on both seem very good as poos are solid and healthy . I recommend this dog food because it's healthy and environmentally sound too. Well done green pet food. Hopefully it will become cheaper soon as more and more people demand protein from insects.